Made at My Father’s factory in Estelí, Nicaragua, La Gran Oferta employs tobaccos from the company’s Nicaraguan farms along with an oily Ecuadorian Habano Rosado wrapper. While La Gran Oferta may be a new offering, it is inspired by an old cigar brand sold under the same name over a hundred years ago. Five formats are available: Robusto (5 x 50), Toro (6 x 50), Torpedo (6.1 x 52), Toro Gordo (6 x 56), and Lancero (7.5 x 38). All come in boxes of 20 with individual cigars sold for around $8. I smoked two in the Robusto size, though the inclusion of a Lancero as a regular production vitola is notable. The firm cigar features an open draw and pre-light notes of wood with a hint of mint. Once lit, it produces loads of smoke and medium- to full-bodied flavors. Construction is flawless, with a sturdy gray ash. Dominant flavors are toasted bread, rich espresso, and slightly gritty earth. As it evolves, subtle red fruit and citrus notes enter the equation, along with some creaminess. The finish is short with dry, slightly chalky notes. In comparison to lines My Father Cigars makes for other brand owners, including Pete Johnson’s Tatuaje and Ashton’s San Cristobal, the My Father brand might be a bit overlooked. That’s a mistake. Top to bottom, My Father cigars are excellent, and La Gran Oferta slots in nicely as more full-bodied than the original line, but less so than the Ecuadorian Sumatra-wrapped The Judge or the Nicaraguan Habano Oscuro-wrapped Le Bijou 1922. Particularly if you are a fan of Ecuadrian Habano-wrapped cigars, this is one to try. 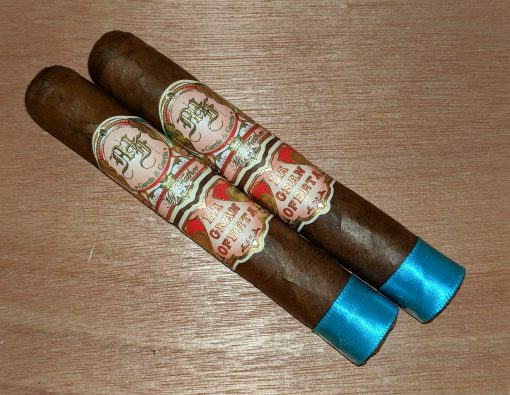 With a complex mix of medium- to full-bodied flavors and excellent construction, the My Father La Gran Oferta Robusto earns a rating of four stogies out of five. I have smoked everything that the Garcia’s make but I have to say that with so many new cigars appearing constantly, I’m thinking of just sticking to a few old favorites.